With this lion accessory set, you'll be ready to rule the jungle! The fun accessory kit comes with a brown, plush tail that attaches with a safety pin (not included). Faux fur covers the end of the tail and is also found on the headband which features a pair of plush ears. 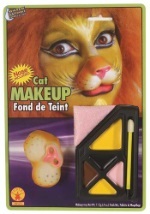 The accessory set is great on its own, paired with our lion makeup or added to our Cowardly Lion costumes!